This is the time of year when every culinary scribe in the nation chips in to solve a seemingly widespread problem: What to Drink with Thanksgiving Dinner. Wine writers have made pinot noir a standard tipple to pair with turkey and stuffing. Beer writers are making inroads with the argument that, actually, craft brews offer way more variety for Thanksgiving pairings than wine. Historical purists would advocate drinking water, as that is likely all the Pilgrims had on hand during their 1621 feast with the Wampanoag Indians. I don’t know if hosts are really in as much agony over what to serve with gravy-soaked root vegetables as they’re made out to be, but if they are, I have an easy answer: Plymouth Gin. Unlike, say, wine, Plymouth Gin actually has a connection to the Pilgrims of Plymouth Colony. The Mayflower set sail from the original Plymouth, in England. 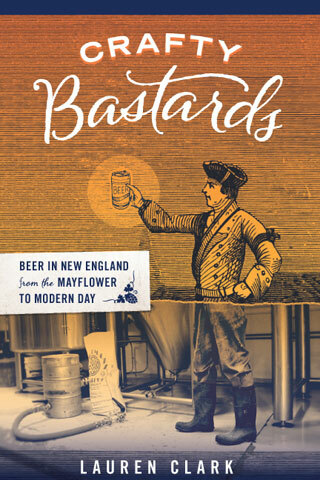 Not only that, the night before they left for the New World, the Pilgrim Fathers lodged in a former monastery dating from the 1400s that is today known as Black Friars Distillery, a.k.a. the producer of Plymouth Gin. The ship that appears on the gin’s label? Yep, it’s the Mayflower. 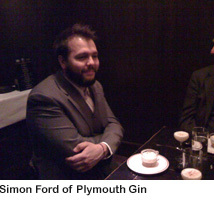 I learned all this on a little junket I attended recently: a dinner in Eastern Standard‘s private dining room with Plymouth’s brand ambassador, British drinks expert Simon Ford. (For the record, I was a devotÃ©e of this crisp, balanced gin before the company plied me with product.) This was a multi-course Thanksgiving of sorts that paired Plymouth Gin-based cocktails with dishes that featured some of the botanicals used in distilling the spirit. 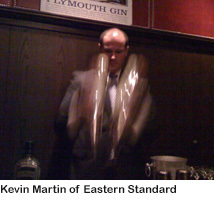 Kevin Martin led the Eastern Standard bar staff in mixing up French 75s, Alaskas and Gin Flips, among others. 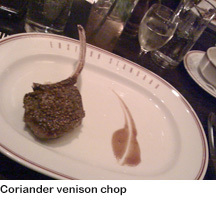 Dishes included a coriander-crusted venison chop, rabbit terrine with juniper berries, and cardamom tapioca pudding. And, believe it or not, before dinner we were given a steamed towel scented with orris root. Fancy! Reps from the Pernod Ricard company, which owns the Plymouth brand, informed me that Boston is a hot market for this gin. Given that every bar doing classic cocktails stocks the stuff (thanks largely to the pioneering B-Side Lounge), I’m not surprised. Not long after it was first distilled in 1793, Plymouth Gin became the official gin of the British Royal Navy. And because the navy shipped it everywhere, it became one of the first global brands. Black Friars Distillery is the oldest working distillery in England, with records of spirit-making dating to the 1600s. Like Scotch whiskey and Cheddar cheese, Plymouth Gin has its own appellation contrÃ´lÃ©e, which means the spirit can only be distilled in Plymouth. The pot still in which every drop of Plymouth Gin is made was installed in 1850. In 1896 the first printed recipe for a Dry Martini, in Stuart’s Fancy Drinks and How to Mix Them, specified Plymouth Gin. If you walk into Eastern Standard next week and wonder who that new kid is behind the bar, count your blessings. His name is Daniel Eun, and he works at PDT (Please Don’t Tell), a speakeasy-style cocktail bar in lower Manhattan. 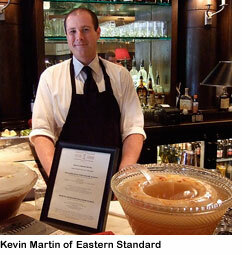 And if you’re wondering where Eastern Standard’s sweet-faced Kevin Martin is, don’t worry. He’s shaking up a few ES cocktails down at PDT. Yep, it’s a bartender exchange. Jackson Cannon, bar manager at ES, and Jim Meehan, owner of PDT, are sending these two talented, young emissaries to each other’s bars for three nights: Monday, Tuesday and Wednesday. At PDT, Kevin will greet a clientele of in-the-know cocktail enthusiasts who enter the bar by ringing a bell on the wall of a phone booth inside a hotdog joint. At Eastern Standard, Daniel will tend to a sprawling mix of cocktail enthusiasts, businesspeople, baseball fans and tourists who enter the place through a clearly marked entrance in bustling Kenmore Square. Both bartenders will bring with them an abridged menu of drinks from their own bars. I, for one, am looking forward to meeting Daniel and ordering one of his cocktails. “He’s pretty feisty, they say. Young and gung-ho,” says Cannon. The mastermind behind the bartender exchange is another NYC mixologist, Philip Ward of Death & Co. He helps coordinate the exchanges along with Rob Cooper, distiller of St. Germain Elderflower Liqueur, who as a goodwill gesture provides a small stipend to the bartenders for travel and lodging expenses. These two guys got wind of a “shot war” between Boston and New York bartenders who attended Tales of the Cocktail this year (the only war in which shots of Grey Goose are considered an attack), and figured they might as well nurture that rivalry. Good luck, Kevin and Daniel.